A layered dessert is perfect for a special occasion. This page contains layered dessert recipes. This is a quick, easy, tasty dessert. This would be a great make ahead dessert for company when you're short on time. It also looks pretty! Make sure you serve it in a clear glass cup/wine glass so that you can see all the layers. Total Time: About 10 minutes assembling time. Prepare your pudding according to package directions. Leave in fridge, covered, until it is thoroughly set and chilled. Gather your glasses, clear will be best. You want to be able to see all your pretty layers. A wine glass would be great too! Using a long skinny spoon, start by layering your ingredients. Be careful not to get your yummy goodness on the sides of your glass. You want all layers neat and pretty. 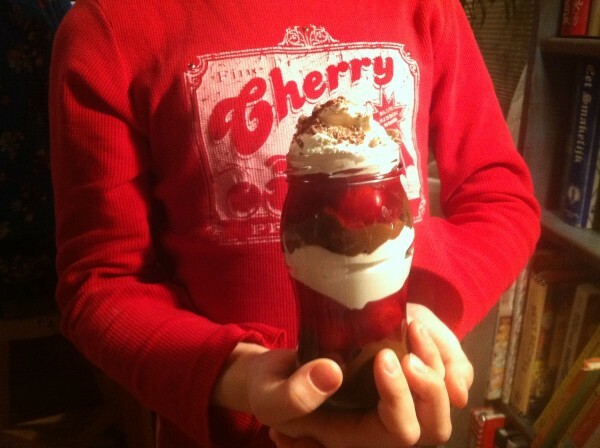 Pudding, cherries, Cool Whip. Repeat once more and top with chocolate chips. Line the bottom of a 9x13 inch pan with graham crackers. In a large bowl, combine pudding mix and milk. Stir well. Stir in whipped topping. Spread half of the mixture over the graham cracker layer. Top with another layer of graham crackers and the remaining pudding. Top all with a final layer of graham crackers. Frost with chocolate frosting. Refrigerate. This is a chocolate lover's dream! I prefer to skip the pecans for garnishing. Blend flour, margarine, and pecans. Pat into 9x13 inch pan. Bake at 375 degrees F for 15 minutes. Cool. Mix the cream cheese, powdered sugar, and 1-1 1/2 cups Cool Whip together. Spread over crust. Prepare pudding with milk. Put that over first layer. Top with rest of whipped cream and garnish with pecans. Refrigerate. 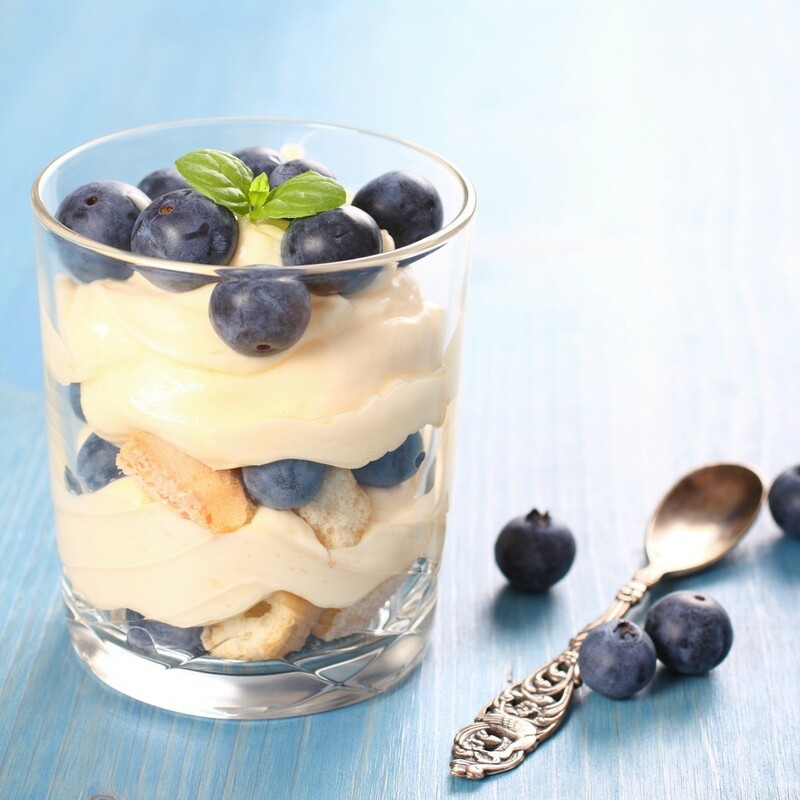 A three layer no bake blueberry dessert. Make this delicious dessert for your next party...it is sure to be a hit! Mix ingredients and pat into a 9x13 inch pan. Bake at 325 degrees F for 15 minutes. This is great because you can use any flavor pudding you want, so you can switch up each time you make it for a different taste every time! Very good! Blend flour, melted margarine, and nuts. Pat into 9x13 inch Pyrex pan. Bake 20 minutes at 350 degrees F.
I am looking for a dessert recipe that has a graham cracker crust, filling, and is topped with chocolate frosting. It tastes just like a chocolate eclair. 1. Line the bottom of a 9x13-inch pan with graham crackers. In a large bowl, combine pudding mix and milk. Stir well. Stir in whipped topping to pudding mixture. Spread half of mixture over graham cracker layer. Top with another layer of graham crackers and the remaining pudding. Top all with a final layer of graham crackers and frost with chocolate frosting. Refrigerate until serving. This is the receipe for the Eclair Cake. Our family loves it so much it's even requested for birthday cakes.